I approached Heart’s Blood with great anticipation but ended it with disappointment. What I adored about Marillier’s YA fantasies [b:Wildwood Dancing|13929|Wildwood Dancing (Wildwood, #1)|Juliet Marillier|http://d.gr-assets.com/books/1320541546s/13929.jpg|2024857]and [b:Cybele's Secret|963508|Cybele's Secret (Wildwood, #2)|Juliet Marillier|http://d.gr-assets.com/books/1335030790s/963508.jpg|948409] was the lush writing, achingly sweet romances, and meandering yet still intricate plots. Sadly, all of those elements were missing in Heart’s Blood. As I sat down to dig into this book, I was initially thrown off by the writing style, particularly the dialogue. I expected it to improve as I read on and grew accustomed to it, but unfortunately, the writing was weak for me throughout. I found the dialogue stilted; it was awkwardly formal while also sounding a shade too modern. As a result, the entire rhythm of the book was off for me because I was thrown out of the story whenever a character spoke. Marillier also relied on another writing no-no of mine: internal dialogue. When I wasn’t distracted by the spoken dialogue, I was irritated by the heroine Caitrin’s thoughts. I loathe inner dialogue, since as a rule, it seems that all human beings sort of loathe themselves on the inside. Thus all inner dialogue is too full of diffidence. I totally acknowledge that if my thoughts were presented to the world, they would not be that interesting because most of them are inane and selfish. I think most people’s thoughts are like this, so while a self-effacing and dull inner dialogue is rather realistic, I don’t appreciate this element of reality in literature. Inner dialogue is too pathetic and boring, and I hated hearing Caitrin’s steady roll of silly thoughts. 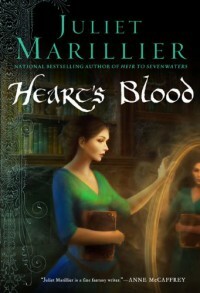 In terms of plot, Heart’s Blood was not much better. Everything about this book was so obvious to me as a reader, but of course, painfully non-obvious to the characters. A book needs conflict, but if I can see the resolution to a conflict with no difficulty, is it truly a conflict? Furthermore, if the conflict develops due to idiotic decisions on the part of the characters, is that a truly a conflict? No and no. I predicted everything that happened miles ahead of time. There was little complexity; there were no problems without easy solutions. This issue especially came to head with the romantic plot. Most of the reviews I’ve read praised the slow-burning romance, but to me, the romance was unsuccessful because there was never any question that things would not work out. Because of these weaknesses, Heart’s Blood was very trite to me. Even the theme itself—the idea that anyone can overcome tough times with inner strength and hope—is a bit too afterschool Disney special. Although many reviewers loved this tale, I found it too simplistic. I enjoy being challenged as I read, and unfortunately, Heart’s Blood didn’t encourage me to think strenuously in any way.